Cab has steel roof, acoustical headliner, front windshield glass, electric wiper, supporting corner posts, steel frame door with clear poly vinyl panels (LH Only) and right side and rear vinyl curtains. 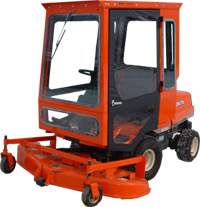 Cab is not ROPS certified, but fits over the existing, un-modified factory ROPS. Special Fit-up Notes: This cab only fits machines with the shorter, tapered ROPS (See last photo below). It will NOT fit machines with the newer, taller, rectangular shaped ROPS (models designated as GF1800-4WR-2 and GF1800-2WR-2). Rear Panel of cab may restrict full rearward seat position adjustment on some Deluxe seat options. Cab height is approximately 72.75 inches high, measured from the ground with specified factory tires.